After realizing that Tropical Storm Emily had made landfall on the other side of the state, we did a quick run to replenish the hurricane supplies. That sure came out of nowhere. Hopefully it won't mean much more than rain. Might put a damper on the roofers that were headed over in the morning though, to fix a leak over the garage. As soon as we got back, I pulled out the Orange Peel quilt to baste. As soon as I walked away to grab the batting, Lizzie moved right in to quality test the quilt for me. It is all basted now, and I have just taken the first quilting stitches. I'm using a number 12 pearl cotton for the quilting. It is the first time I've tried it, but I think it is going to be really pretty. It goes quick too. Bonus! Lizzie grudgingly relocated to the back of the couch. She doesn't seem too happy about it. We'll have plenty of time to bond though, it looks like a couple or rainy days are headed our way. It is the last weekend before school starts again for teachers. 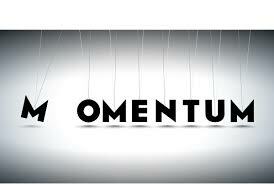 On Thursday we will all report back to work and start to get ready for a new year. 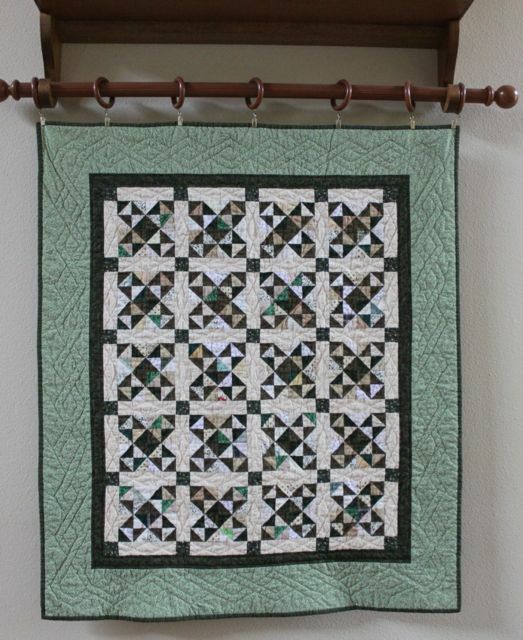 Today though, I am celebrating the completion of a quilt. The green Broken Dishes blocks were made from the bonus triangles for a Sister's Choice quilt which I made for Mom. They finished up at some odd size. 1 and 3/8 inches maybe? Most of the units weren't big enough to square up to 1.5 inches, and 1 inch just seemed so very tiny! After they came together, the hand quilting took a while of course, but it is done now! Each block got four orange peels pointed to the center of the block and then I made Xs in the sashing pieces. 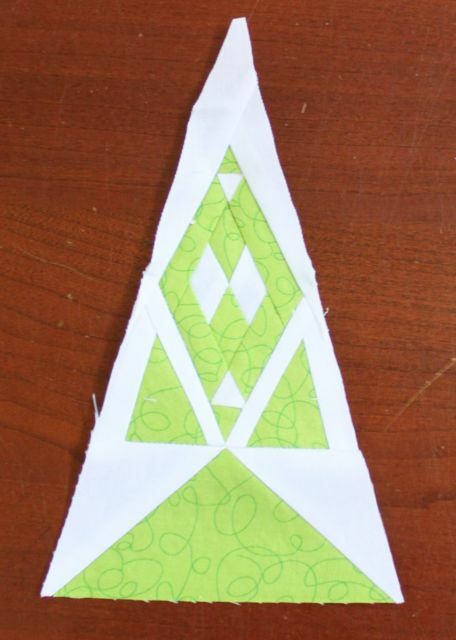 The border is a triangle shaped rope for which I had a stencil. The corners got a bit unique, but I think it all worked out in the end. 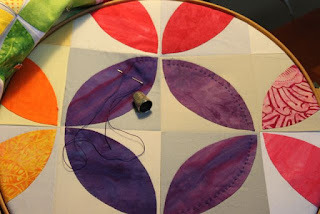 I used frixion pens to mark the quilting lines and it worked like a charm. I just threw the whole thing in the dryer when it was done and hit the quick refresh button. When it came out, all the lines had disappeared magically and it had that great crinkle look that is one of the best parts of quilts. Lizzie approves. 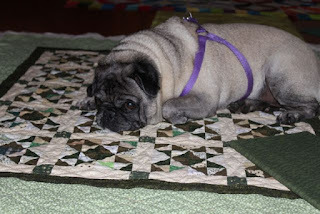 Testing out new quilts is one of her favorite jobs. 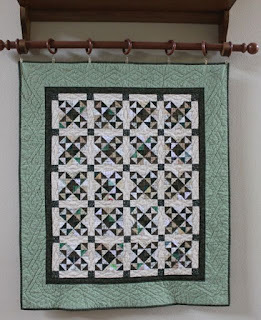 I'm linking up with Slow Stitching Sunday today in celebration of hand quilting and Oh Scrap! 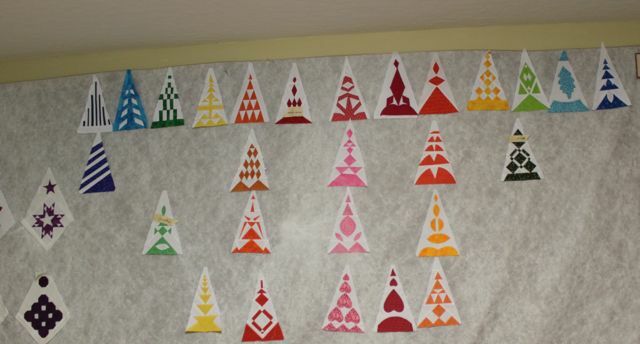 because what could be scrappier than bonus triangles? It is always sad to say goodbye to a color, especially blue, which absolutely goes with everything. Still, finishing off one color is always a sign of something new on the horizon. I'm just back from a morning run, freshly showered and ready to dig in. How about you? Misterlinky is below, please share with us all. I have just turned the last corner on the border for my green Broken Dishes Quilt. It is a fitting metaphor as the last week of summer vacation begins. It is a good time to start finishing up odds and ends while trying to wade back in to thinking about the new school year. 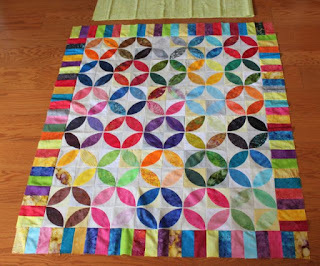 I'm even talking to Mari about a challenge quilt for next year's Rainbow Scrap Challenge. I think that it is going to be awesome! 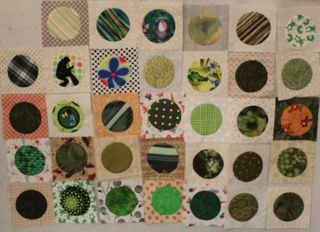 I am anxious to finish off this green quilt so that I can start quilting on my Orange Peels quilt. 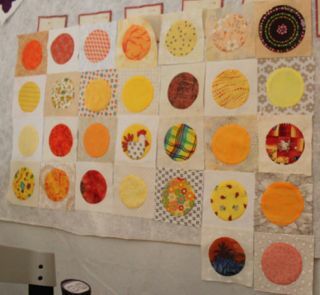 I want to use pearle cotton for the quilting on it which will be something new for me. Yesterday Kurt and I took his sailboat out for the first time ever. He's been working on building it for the last year and a half. There are still a few finishing touches he will work on now that we've taken it for a test run, but it worked great. 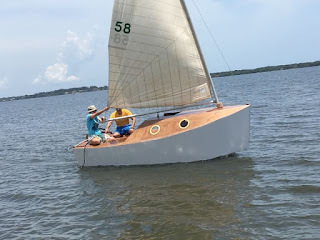 We were out on the river on a beautiful sunny day, sailing alongside 4 dolphins. Not a bad life at all. This morning I was up early to get in a quick run before it got to be too hot. Then Anna and I did a few errands to start getting some supplies for school. It is hard to believe that summer is almost gone! I'm soaking up every minute. 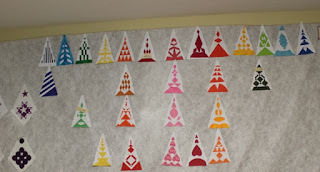 These orange peel blocks were my hand applique project from two years ago. I was trying to showcase the scraps of hand dyes and batiks from other projects. The blocks have been finished for ages, just waiting to be put together into a top. I seem to always get bogged down at that stage. It is all together now though! 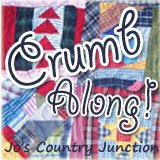 I have a backing fabric picked out, that won't take long to piece together. 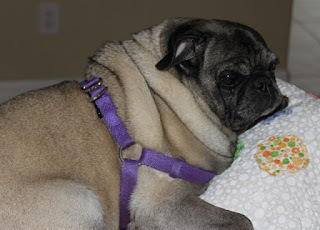 After that a quilting decision needs to be made. I'd love to hand quilt it, but I'm still not done with the hand quilting project that I have in progress. Decisions! Maybe if I go and pull out that other quilt in progress it will motivate me to get it finished up. First though, I think there is laundry and the kitchen needs some attention. Even on summer break, life happens. 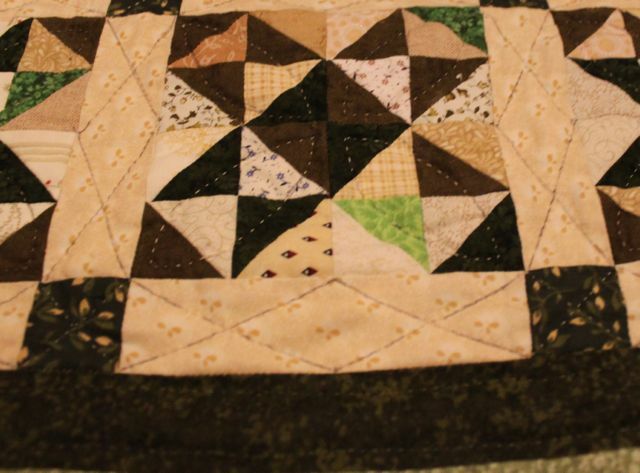 If only everything didn't need such constant attention and upkeep I'd have more time for quilting. The best way to procrastinate for a while longer though, is to spend some time with Kathy at Slow Stitching Sunday, and check out Oh Scrap before real life takes over. Sorry to be off to a bit of a late start this morning. I've started training for a half marathon and today was a long run. Just 4 miles as I am still in the begining phases. After a quick shower though, and a few dropoffs for morning activities, the rest of the day is open for sewing. What are your plans for the day? Misterlinky is below. Share with us all. I've been cutting border pieces today. It is pouring rain outside and its just Netflix and I with baskets of scraps. Bliss! I've been puttering around the house all week not accomplishing much. I thought it would be nice to finish some things off though. These orange peel blocks have been hanging around mostly done for a while now. Today I finished trimming away the background fabric behind the applique and trimmed the blocks all down to size before squaring them up and sewing them into groups of four. 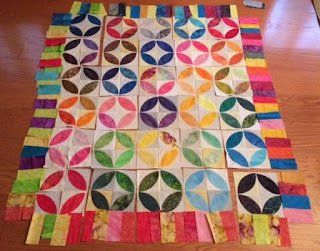 I had no idea how many block there were until everything was sewn together. 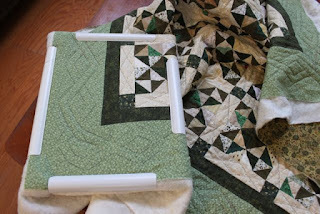 Now I can see that I need eight more blocks to have enough for a small throw quilt. Somewhere I have the templates still I think. If not, I can make another from the finished block. It shouldn't take too long to make that happen. Ryan is volunteering at science camp again this week. Anna has three shifts at the hospital to keep her out of trouble. Poor Sydney doesn't have much on her plate though. She is taking great pride in sleeping until lunch and staying up until all hours of the night. School is just around the corner. We'll have to get her back into routine before then. One thing about living life on the road is that there is plenty of time for slow stitching. 14 hours in the car, several in airports, then planes and busses. So many opportunities to sneak in a circle here and there. We are finally home again though, with no plans to go anywhere at all in the foreseeable future. Red has more than one month, and I need to figure out where one ends and the other starts. The yellows are all ready to be sewn together. Not all the trips have made it into the photo stream, but here are a few highlights. We took the kids to Universal for a few days. We have annual passes this year, so it was a great opportunity to take advantage of them. 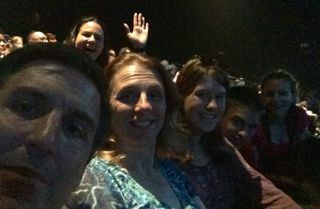 This was us at the Blue Man Group. Anna and Sydney both loved it. Ryan wanted to know why is was so strange. We were trying to get a group shot when the lady behind us photobombed us. I told here I would tag her on Facebook, but I've forgotten her name now, Karen something? 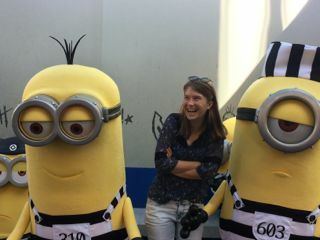 Anna is way too old, but still wanted to pose with the minions. Before that was my trip to Kansas City to grade AP exams. 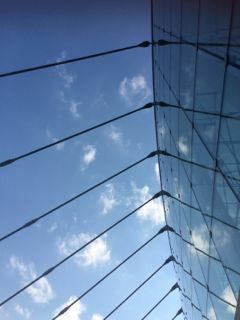 The performing arts center was really cool. From certain angles, it looked a lot like the Sydney Opera House. 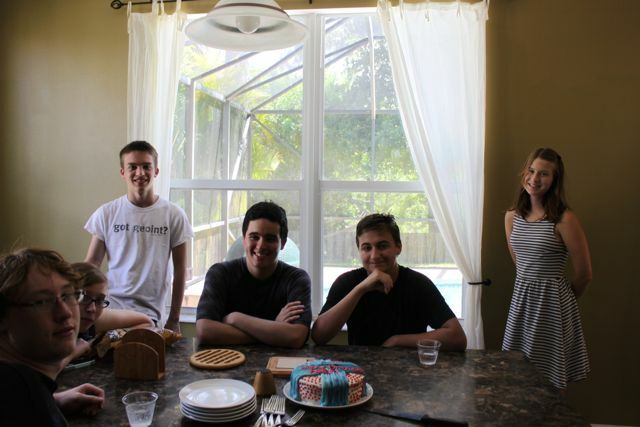 After that we were off to Atlanta and dropped the kids off with their cousins before heading out to an adults only all-inclusive resort. So relaxing! No photos yet, but I'm sure they will show up before too long. So now, finally, I am home again for the rest of the summer. I think there are full two weeks with no major activities or trips! I can't wait. The summer list is long, and I'm sure that I can't get to all of it, but I will give it a try! Hope that you have found some time to dig into your blue. Think of water and cloudy skies. In honor of the July being the blue month for RSC17, I finished off Dear Jane top row triangle 13. I love the little melons which I prepped and tucked into the seams before the geese got sewn together. Then it was quick and simple to finish off the little bit of applique to hold them down all the way around. 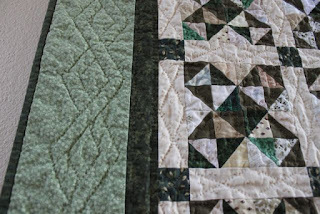 Then this last green triangle was all that was necessary to finish off the entire top border. So TaDA! 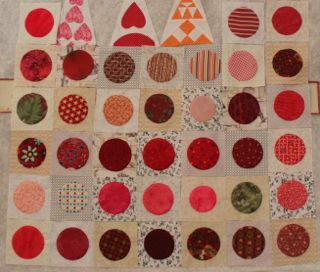 Here is the top border for my Dear Jane quilt at long last. 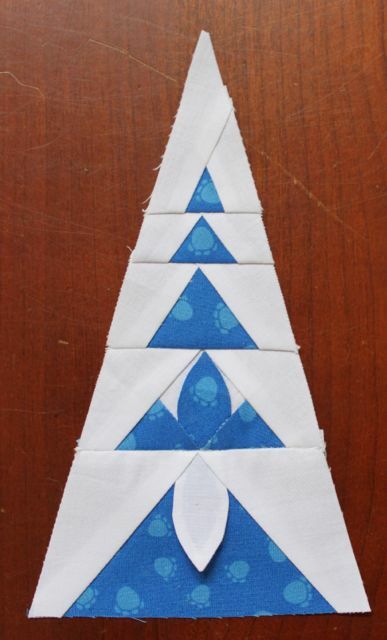 The silly triangles seem to take so much longer than the little blocks, but I'm determined to get them finished off. Here is my little map of progress. 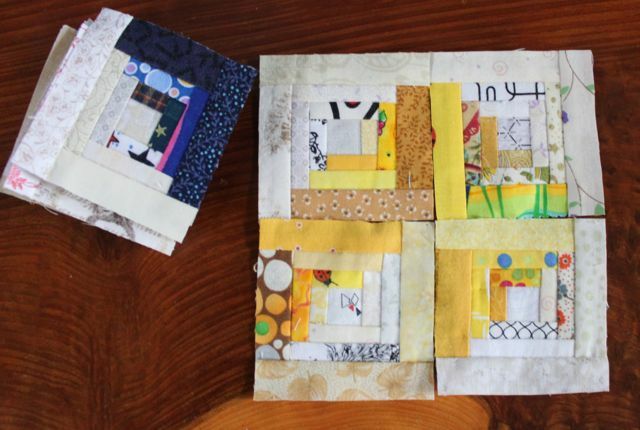 I've been saving squares and rectangles for each of the fabrics as I finished the blocks. Getting closer every day to getting this one done. Saturday Ryan had some friends over for his birthday. It was a nice motivation to finish off some cleaning and organization projects that had been on the list for far too long. The kids had a good time too. Time to phase out yellow and start to work on blue. Hope you are feeling energetic, I know that blue is a big color for most quilters. It sure is for me. After a month of sparse scraps with yellow, it will be nice to have plenty of choices this month. I did get one more triangle done yesterday. Ignore the odd tilt to the diamond at the top. It was supposed to tilt the other way. 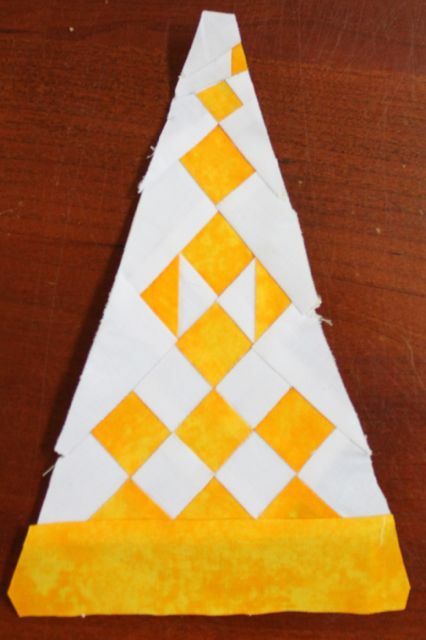 I am always mystified by paper piecing patterns with inset seams. Seriously, how is that supposed to work? Not so well when I am attempting it apparently. Life is full of imperfections though, and I'm fine with that. I did manage to dig up enough yellow skinny scraps to eke out these tiny log cabins. I'll need to generate some more scraps in the yellow bin before there is enough variety for more. Check out the blues though, no end to variety in the blue bin! Please link up below with your own progress on yellow or blue. I'll be back to my scraps soon enough. First though, Ryan is having a birthday pool party today. I'd better go and make sure that the house isn't embarrassing before kids start showing up. Since his friends are also my students, I'll make sure the house is in decent shape. Once they show up though, I'll be trying to hide. I think the sewing room might just be the perfect place.